112 starters and 91 classified finishers. Fausto Coppi was at the peak of his powers in 1952. He delivered a superb, dominating ride that overwhelmed one of the finest starting fields in Giro history. Coppi went on to win the Tour de France that same year, his second Giro/Tour double. At the time, no other rider had even done it once. Nino Defilippis, Raphaël Géminiani, Donato Zampini, Alex Close, Giacomo Zampieri, Giancarlo Astrua s.t. The peloton that assembled for 1952’s 3,964-kilometer Giro was nearly as sparkling as the previous year’s. Coppi, Bartali, Magni, Martini, Kübler, Koblet, Schaer, Impanis, van Steenbergen and Ockers returned. A Spanish team with Bernardo Ruiz and Jesús Loroño (both among Spain’s finest riders), along with a contingent of four Australians widened the growing international nature of the race. None of the antipodeans made it back to Milan. A group of German racers who had even been assigned back numbers were blocked by the German cycling federation which found their terms of employment in the Italian race for some reason unacceptable. At only twenty, neo-pro Nino Defilippis made his Grand Tour debut in the green jersey of Legnano. Many brilliant young Italian riders of this era were allowed or even encouraged to ride too hard and too long while too young, ruining them for greater things. But as we’ll see, Defilippis thrived in the environment of 1950s racing. Coppi acquired a true gregario di lusso in French rider Raphaël Géminiani, second in the 1951 Tour and winner of that year’s mountains competition as well as the ninth stage. Coppi was an avid student of the sport of cycling, studying every aspect: food, machinery, position, tactics, physiology and training, applying what he learned with rigor. One area of many where he transformed the sport was in the structure and management of the professional cycling team. In his hands the team became a machine unified behind one purpose, delivering its leader to the finish line first. Prizes and start money were put into a pot and divided among the team members. Bobet is often credited with this innovation for the 1953 French Tour de France team, but he was merely copying Coppi’s long-established model. Coppi’s gregari, like Lance Armstrong’s domestiques, had to be completely free of personal ambition. For whatever insecurities Coppi had, he usually treated racing as a cold-blooded business that required him to impose an extraordinary level of discipline upon his riders. Punishment for failing to respect Coppi’s primacy could be administered with jaw-dropping brutality. A rider on Coppi’s blacklist could find himself neutralized. Every time he tried to escape he would find the Bianchi squad (and other teams wanting to score points with Coppi) chasing him down. Loretto Petrucci, a Bianchi teammate, had the audacity to beat Coppi in the 1953 Milan–San Remo. Coppi thought Petrucci’s star was shining a bit too brightly so at Paris–Roubaix Cavanna, with Coppi’s assent, put a powerful laxative in the food Petrucci picked up in the feed zone, forcing the young rider to quit in misery. The Bianchi riders, on the other hand, knew that they made a lot more money seeing that Coppi had enough water and food, or secretly pushing him up hills to conserve his energy, than they would racing for personal glory on some other team. Coppi realized that this system imposed enormous personal responsibility to this elite group who were dependent upon him for their living, hence his willingness to ride the 1951 Tour while nearly paralyzed with grief. It had been a long time since Coppi had really delivered the goods, but in 1952 he was in no hurry. He was thinking big. He wanted to repeat his 1949 triumph, the Giro-Tour double. That meant a slower lead-in to the season. So for that spring he had no notable wins, but a second to van Steenbergen at Paris–Roubaix demonstrated his excellent form. The first stage of the 1952 Giro left Milan for Bologna and ended with a powerful nine-man group containing Coppi, Magni, Petrucci and Giorgio Albani sixteen seconds clear of its nearest chasers. Albani was in pink but Coppi and Magni had made their abilities and intentions clear. Though Géminiani was French, his grandparents were Italian, from Lugo near Bologna. They traveled to Bologna to see their grandson finish the first stage. After the race his grandmother told him that he must be very tired after all that racing and that he should come to their place in the country to get some rest. The next day went over the Apennines with the Abetone the day’s major difficulty. With Géminiani, Coppi had a powerful card to play. When he sent the Frenchman up the road on breaks, the other teams had no choice but to burn precious energy chasing him. A man who had taken second in the Tour was fully capable of winning the Giro and could not be ignored. “Gem” performed brilliantly, being first over the Abetone and finishing in the winning break almost two minutes ahead of the next group, which included Coppi (who didn’t have to work with his teammate up the road in the break), Bartali, Magni and Kübler. Defilippis and Astrua were part of the winning group, putting them at the same time as the new leader, Angelo Conterno. Defilippis’ sharp riding meant that when he finished well in Siena in stage three, the twenty-year old phenomenon found himself leading the Giro d’Italia. Tragedy struck in stage four when Frejus rider Orfeo Ponsin died after going off the road and crashing into a tree while descending the Merluzza on the road to Rome. This fatality and the deaths of the Coppi and Bartali brothers may make the sport of cycling seem mortally dangerous, but it really isn’t, even in the helmetless twentieth century. Broken bones (professional cyclists suffer from osteoporosis because the sport isn’t sufficiently load-bearing to stimulate bone growth while they sweat away minerals that aren’t replaced) and torn skin are common but fatalities are rare. While several spectators had died, I believe this was the first death of a Giro competitor. 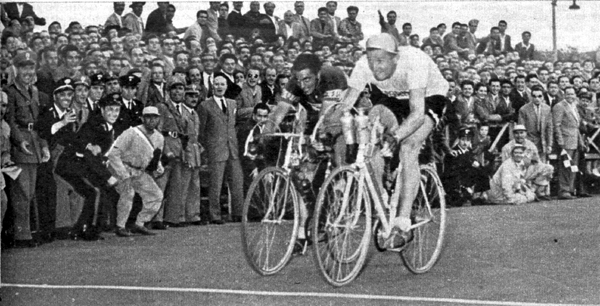 Désiré Keteler beats Alfredo Pasotti to win stage 4 in Rome. Astrua was almost able to keep his lead as the race headed for its stage eleven appointment with the Dolomites—almost, because he crashed on the road to Venice in stage ten and finished with the main peloton more than five minutes behind Coppi, Bartali, Ockers, Magni, Koblet and Kübler, who all finished with stage winner van Steenbergen. Astrua’s crash meant that Coppi had the wonderful morale boost of the Pink Jersey while facing the Falzarego, Pordoi and the Sella passes in the year’s tappone. The other riders understood that Coppi’s aggression was directly proportional to his confidence and they knew his commanding form and wonderful self-assurance meant that Coppi would administer a flogging in the Dolomites. The Venice–Bolzano stage was the scene of a perfect Bianchi tactical set-piece. Géminiani took off early in the stage while Coppi took his time dispatching his rivals before joining the Frenchman on the Falzarego. Eventually even Géminiani couldn’t stay with the splendid Coppi. Part way up the Pordoi, Coppi bolted and rode the last 80 kilometers of the stage alone. Bartali and Magni managed to catch and pass “Gem” but they were still more than five minutes behind Coppi by the time they reached Bolzano. Kübler, Ockers, Schaer and Géminiani were another minute back. It was a fabulous display of power that left some of the greatest riders not only of that era but of all time bereft of any hope of winning the 1952 Giro d’Italia. Who alive in 1952, or any other time for that matter, could take back eight minutes from a surging Fausto Coppi? Coppi went from strength to strength. Stage fourteen was a 65-kilometer time trial held just north of Milan, which Coppi won, just barely beating out-of-contention Koblet but taking nearly two minutes out of General Classification second-place Magni. The Alpine stage was almost an anticlimax, Coppi was content to stay with Magni and let Géminiani hoover up mountains points. 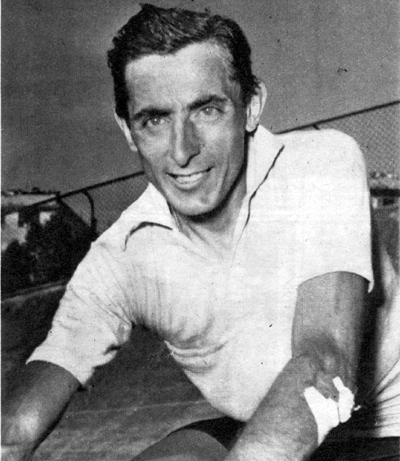 Coppi biographer William Fotheringham noted that he thus both rewarded Géminiani with the opportunity to clinch the climber’s prize, and denied that same trophy to Bartali. Coppi had won his fourth Giro d’Italia, and did it with economy and style. In July, Coppi raced the Tour in what now has to be considered that race’s most dominating postwar ride. 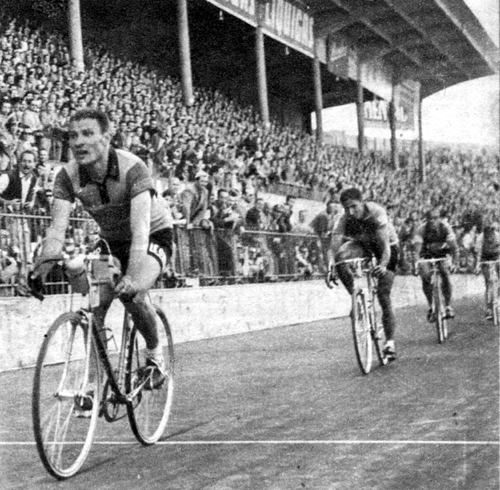 Kübler, Koblet and Bobet all had health problems that prevented their riding while Géminiani, although riding on the French national team, never forgot that he was a Bianchi rider. One way or another, the most serious competition was neutralized. Coppi could leave the others virtually at will and eventually distanced second-place Stan Ockers by more than 28 minutes. For a second time Coppi had done the Giro-Tour double, something no other man had ever accomplished even once. Coppi would never again race the Tour. Because Géminiani had not forgotten his Bianchi ties in the Tour, he was left off France’s team for the World Championship. Reading the handwriting on the wall, “Gem” left Coppi and Bianchi for the Métropole-Dunlop team at the end of the year. Coppi’s life began a strange turn. He began to make contact with Giulia Locatelli, the wife of racing fan Enrico Locatelli who had visited him in the hospital back in 1950. For now the relationship was innocent. For now.